Contributors: Anthony Almeida, Johann Boteju, Barbara Genco, Tom Hedderich, Bill Howard, Alexander Katlan, Beth Kurtz, Karen Loew, John Mansueto, Robert Mueller, Chris Nunnally, Annie Patt, Robert Pillsbury, Griff Seymour, Thomas J. Shelford. The Salmagundian is the Journal of the Salmagundi Club of New York, chronicling its everyday activities and careers of its members. The current weblog supersedes earlier print publications: The Bulletin, Salmagundi Notes, The Salmagundian and The Stew. Email subscriptions to The Salmagundian are free of charge and open to both members and non-members. The subscription widget can be found on every page of the blog and requires email confirmation to prevent unauthorized registrations. Letters to the editor, suggestions for articles and completed feature articles are always welcomed. • Around Town, On the Trail and On the Web: Upcoming exhibitions and events beyond the four walls of the clubhouse that involve or may be of interest to members. • Tagged: Photos of SCNY members at recent exhibitions and events (current/recent events only, please). Images MUST include the member. Visible artwork can range from a single item to a grouping. Please include all relevant information about the event and any highlighted artwork. • Bulletin Board: Miscellaneous announcements and notices of opportunities of all kinds open to Salmagundi members including but not limited to calls for entries into group exhibitions, trade shows, art fairs, workshops, art tours and trips. The Salmagundi Club and The Salmagundian assume no responsibility for the actions of any outside organization, vendor or other entity and strongly recommend members exercise due diligence before registering or sending payment for any non-SCNY event, exhibition or trip. Study prospectuses and, if applicable, liability disclosures and refund policies carefully. • Requirements: Submissions should include an image of a work of art in the show (if applicable) and complete details including dates, hours, venue, address, phone, website, reception information and if it’s solo or group. Always send original full-size images. Jpegs and plain text only. We reserve the right to reject submissions that do not meet minimum quality standards or appear not to be recent. • Deadlines: Around Town, On the Trail and On the Web event listings are published on the 25th of the preceding month. Late listings can be edited in after publication and are welcomed. Bulletin Board notices are published individually as they are received and have no deadlines. • Press Releases and Requests for Coverage: We ask that you send releases, invitations and requests by email. Founded in 1871, the Salmagundi Club of New York is the second-oldest continuously operating professional art organization in the United States. 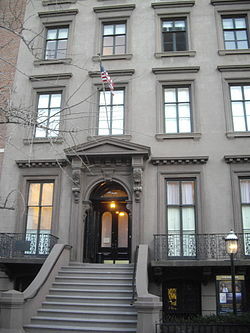 Ensconced in a landmarked 1852 brownstone mansion on lower Fifth Avenue in Greenwich Village, New York City, the Club offers programs including art classes, exhibitions, painting demonstrations, and art auctions throughout the year for members and for the general public. The building houses three galleries, a library, elegant period parlor and a dining room and bar with vintage pool tables. Our facilities are popular for private rentals, special events as well as television and film shoots. The Salmagundi Club of New York has a membership in excess of 850 artists and patrons and owns a collection of over 1,500 works of art spanning its 140+ year history. Its members have included important American artists such as Thomas Moran, William Merritt Chase, Louis Comfort Tiffany, N.C. Wyeth and Childe Hassam. Today the Club builds on this legacy by providing a center for the resurgence of representational art in America.